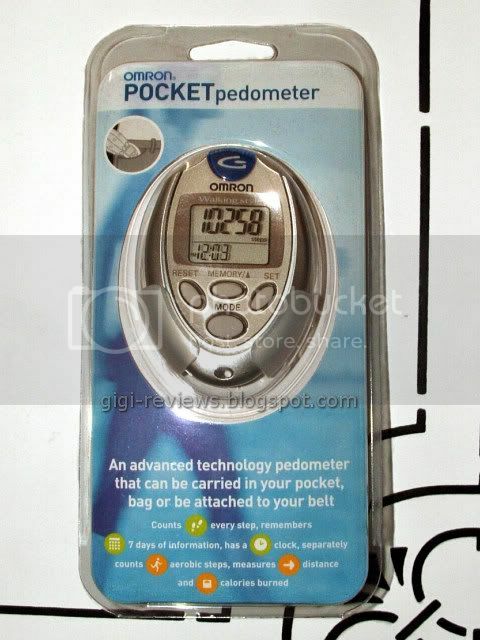 Gigi-Reviews: WOOHOO!! 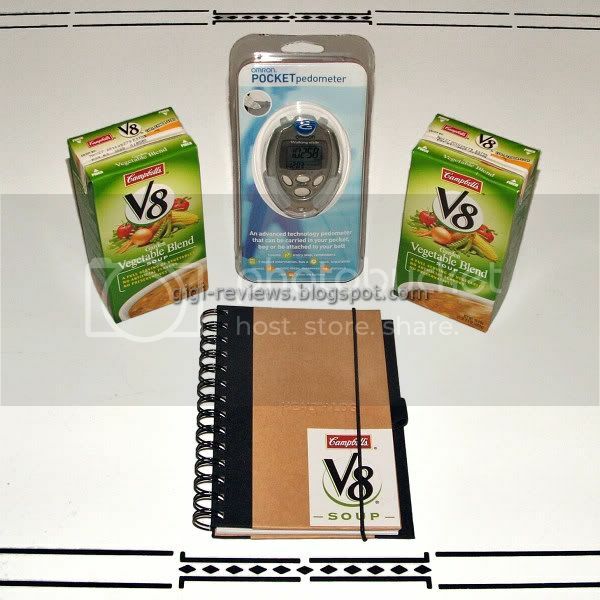 Campbell's V8 Soup Give Away! 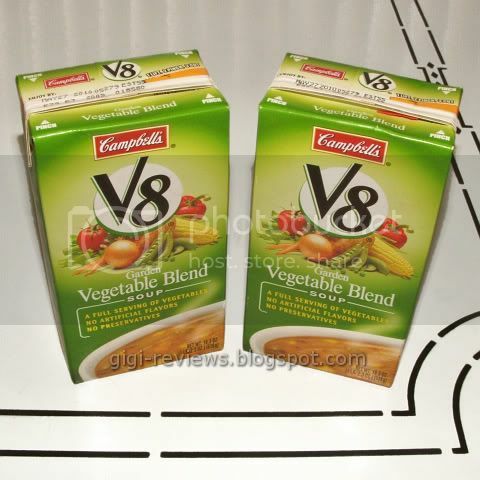 Last month I reviewed the very yummy Campbell's V8 Garden Vegetable Blend Soup. Besides tasting great, one of the fab benefits of the soup is that it gives you a full serving of vegetables in one single bowl (oh yeah, and there are other good things about it, like added fiber and vitamins A & C). And since the inventors of the Internet have yet to come up with a scratch-n-sniff version or even Lick-O-Vision, the good folks at Campbell's have come up with the next best thing: They have put together a gift pack for one lucky winner! Not only does Campbell's want you to eat your veggies and love it, but they want to help you get healthy. The holidays are just around the corner, and who doesn't want to look smoking hot come New Year's Eve? OK, so you don't walk around in Speedos on New Year's Eve, at least not here in the Northern Hemisphere (unless the New Year's party you're attending gets a bit wilder than we can discuss on a family web page), but that isn't the point. The point is, you'll know you look smoking hot. And that is always a good thing. ...and a hardcover, spiral-bound health journal. Admit it, your life will not be complete until you win! So how do you win? Simple. 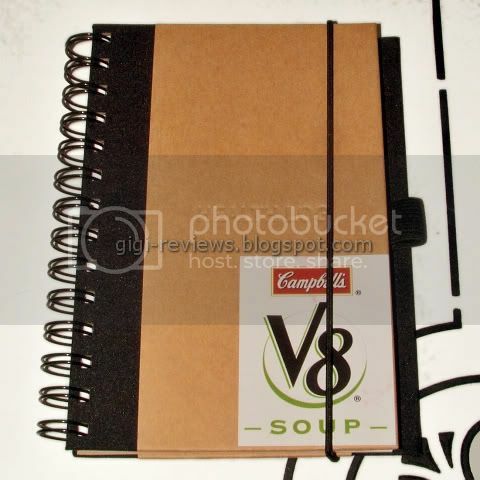 Just leave me a comment telling me why you love V8 or Campbell's soup (or the Campbell's V8 Garden Vegetable Blend soup). Winner will be announced on Monday, Nov 9. The winner will be asked to submit their email address via comment (don't worry, it will NOT be published), so I can contact them for mailing information. Winner's personal info will not be auctioned off to the highest bidder on eBay, sold to Somalian pirates, bartered for Pez, or otherwise shared in any way. One entry per person. Entries start Monday, October 26th, and will be accepted until Saturday, Nov 7th at 12:00 AM PST. I drink a glass of low sodium V-8 every day, though I "improve" it with a couple of shakes of Texas Pete hot sauce. Unfortunately, the spicy hot version of V-8 doesn't come in the low sodium variety, and the salt in the regular V-8 overwhelms the flavor, in my opinion. I lurve V-8, but I admit it's been awhile. And Campbell's is a lifelong fav. That's just the way it is. And I ain't changing! I love Campbell's Soups because they have been a staple in my home since I was little. When I'm sick, all I want is a can of Campbell's Chicken Noodle Soup! I love the v-8 soups. They are quick convienient and healthy! I'm a super campbells fan! Haven't really tried this soup yet, looks interesting! I like Campbell's soup on a chilly night. Best with a piece of toast. Their CK noodle soup was my "medicine" whenever I got sick as a kid. Campbell's is my preferred brand of soup especially their chunky brand healthy request products. I imagine these are just as awesome as their other products. v-8 is really yummy, but very high in sodium, but i still love it. I love taking the Campbell's tomato soup and putting in curry powder to give it some spice. I've been enjoying this as well as most of their soups my whole life. I never had the v8 soups but I like soups in general so I't would be nice to try it. I like the V8 fusion juices, because they give me an incentive for eating my vegables. Plus, Campbell's soup has outlived most of my older relatives- what's not to love about it? I love the taste of Campbell's! It's the best on a cold winter day. I've never tried it before, so I need to win to find out if I do! I love the V8 spicy juice, though.